Episode 01—Get Your Grills Hot! Episode 01&mdash;Get Your Grills Hot! 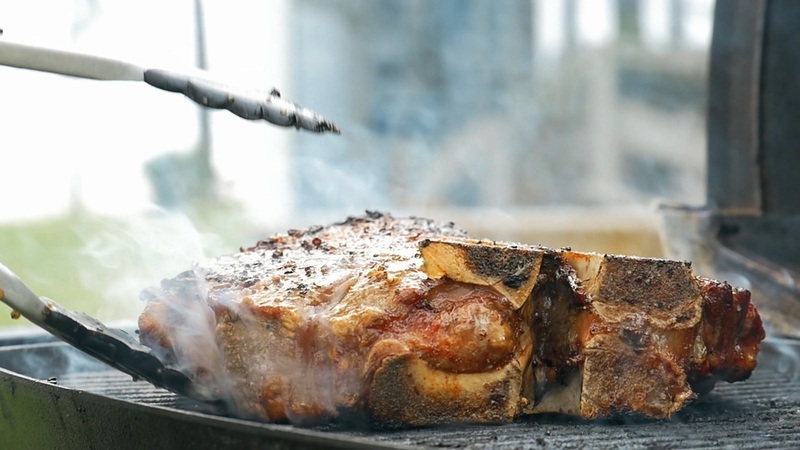 Today on Carolina Cooks, we're out back grilling up a tasty and easy summertime meal: grilled porterhouse steak with a compound butter, grilled asparagus with Romesco sauce, and a grilled romaine salad with Kyle Wilkerson's blue cheese dressing. We also visited Rose's Meat Market & Sweet Shop in Durham, NC to talk with owner Justin Meddis about artisanal and sustainable butchery. So get your grills fired up, and let's get cooking! Take your steaks out of the fridge at least an hour before you cook them, and pat them dry with a paper towel. Season with some olive oil, Kosher salt, and freshly ground black pepper. Grill on medium-high heat for 16 minutes. Season with olive oil, Kosher salt, and freshly ground black pepper. Grill on medium-high heat for 16 minutes, or until well-charred. Chop the herbs and shallots and stir into the softened butter. To save the extra butter, spread onto a sheet of wax paper and roll up into a log. Seal in a freezer-safe bag and store up to 5 months. Split heads of romaine in half and season with olive oil, Kosher salt, and freshly ground black pepper. Grill cut side down on high heat for 3–4 minutes, then flip and grill other side 1–2 minutes. Mix blue cheese, mayonnaise, Texas Pete, and Worcestershire sauce in a bowl. Chop chives and parsley and mix into the bowl. Stir in full fat buttermilk until desired consistency. Thanks for watching Carolina Cooks! Follow Carolina Cooks on Twitter and let us know how your steak turned out!